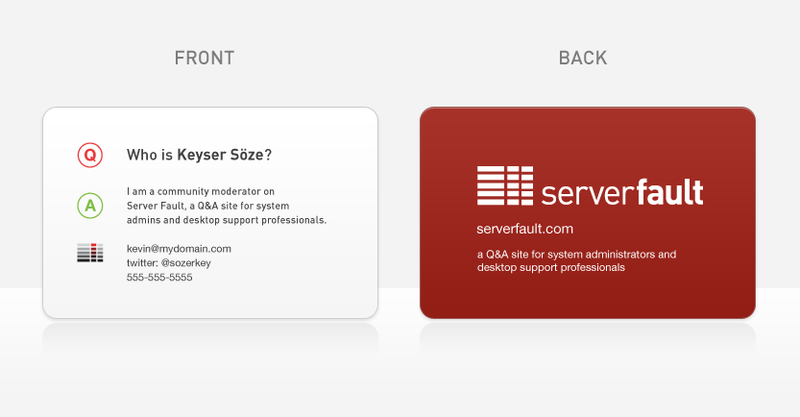 If you're a Serverfault moderator, would you be interested in having your own Serverfault contact card? Would you find it useful? I can see them being handy to pass out during your local tech meetups or conferences. Man I love you guys. Free t-shirts, LOPSA memberships and now business cards (not to mention a very handy 32Gb USB stick). However, I must say, I personally wouldn't have a need for them (same as I had no real need for a LOPSA membership). What I might suggest though is perhaps provide them on-request to anyone who is going to be speaking at a conference or doing lectures or something and the person is in good standing within the community. That way Ben's concerns are also addressed, and the cards get to where they'll do the most work. Honestly, when I'm out about in the community, the ServerFault t-shirt I got does a good chunk of the outreach portion. Now that some of the SE merchandising is available, that may become less useful. Honestly, there are scant few times a year when something like that'll be useful. My new employers are less reticent about sending me to conferences so the chances of getting out and about there are much more likely than they were a year ago. That said, that's a 3x/year thing at best, and for the rest there is a .sig line. 15 cards would be an ample year's supply. Unless I ended up speaking somewhere, that's when I might go through a handful or more. In the end, it's probably not worth the trouble to print 'em up on spec, though having the option when I know I'll be in a high-contact environment would be nice to have! Not the answer you're looking for? Browse other questions tagged discussion design community .